Despite the 1941 Walt Disney film achieving success, including an Oscar win for best score, the Flying Elephant ride faced a slow start due to technological and financial issues. 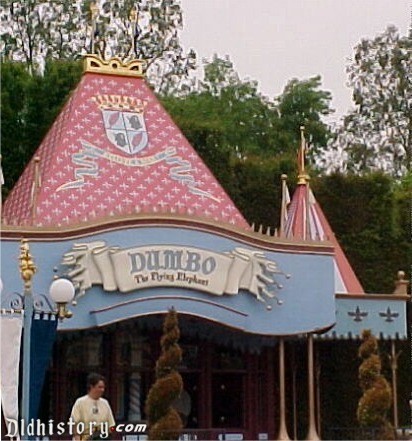 Disneyland's Dumbo the Flying Elephant ride boasts a noble heritage. It's based on the 64-minute 1941 Walt Disney film that won an Oscar for best score and which The Hollywood Reporter called the "gayest and most hilarious feature-length cartoon he has ever created." The movie - which Tim Burton has remade into a CG/live-action film out March 29 - was such a big deal that Dumbo was supposed to be on the cover of Time in December 1941. But after the bombing of Pearl Harbor, he was replaced by Japan's Admiral Yamamoto. As for the ride, it got off to a slow start. When Disneyland opened July 17, 1955, on 160 acres of Anaheim orange groves, the Flying Elephant ride - with its 700-pound Dumbo-shaped fiberglass vehicles - wasn't ready for takeoff. "Plenty of things weren't ready on July 17," says Chris Nichols, author of Walt Disney's Disneyland. "They were inventing new types of technologies from scratch. With Dumbo, each kid was able to fly his own elephant, and the ears were supposed to flap. This turned out to be harder to achieve than anyone expected." Also, the elephants were painted pink in accordance with the scene in which Dumbo accidentally drinks water laced with alcohol and things go psychedelic. Walt Disney himself decided that they should be repainted elephant gray before the ride debuted, a month late. Another factor was money. Disneyland's costs had ballooned from $5.2 million to $17 million ($50 million to $160 million today). It took until the mid-1960s to swap out the malfunctioning ears with hingeless versions. Since then, every Disney park around the world has installed a Dumbo ride, and officials estimate 90 million guests have ridden one somewhere. Harry Truman, however, was not one of them. In 1957, the Democrat declined a trip on the Flying Elephant, deciding a photo of him on the Republican mascot wasn't the takeaway he wanted from Disneyland.